Moina Shaiq created “Meet a Muslim,” a series of gatherings in which people meet her for coffee and talk about the religion, with an aim to show that followers of Islam aren't all alike. In 2015, Moina Shaiq took an ad out of her community newspaper inviting people to meet her for coffee. “Meet a Muslim,” she called it. It was shortly after a Muslim couple opened fire at a San Bernardino office party, killing 14 and wounding 22, and Shaiq wanted to prevent prejudice before it took hold, and show that followers of Islam weren’t all alike. She went to the coffee shop with her laptop, expecting no takers; just to get some work done. But there were 20 people waiting for her. In all, 100 people would respond to her invitation, and Shaiq didn’t leave until every question was answered. “It showed me how much people were extending their arms, reaching out,” she recalled. 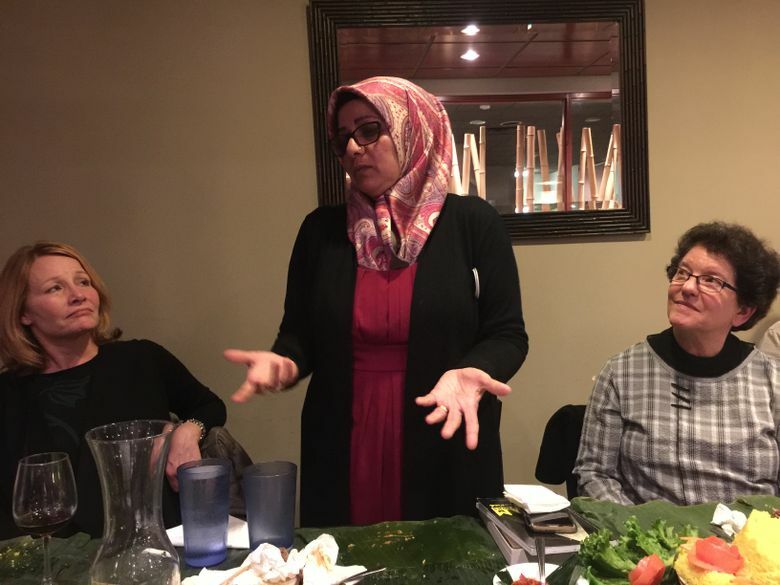 It was the same the other night at north Seattle’s Indo Cafe, where Shaiq met with more than 20 people who showed up hungry not only for dinner, but for an understanding of the religion that some Westerners still know little about. And what they do know is often seen through a suspicious lens. The “Meet a Muslim” event was one of three being held over the next few days by Crooked Trails, a nonprofit focused on cultural exchanges. “You can’t know a country if you don’t know the people,” said executive director Christine Mackay, who recalled Googling “Meet a Muslim” after the 2016 election and finding Shaiq. It took more than a year to get her to Seattle. On Saturday, Shaiq was at the Muslim Association of Puget Sound Mosque, where people were invited “to experience the truth” about Islam and those who practice it. The “Meet a Muslim” event included afternoon tea and a session with Shaiq. And on Monday, Jan. 22, interested people are invited to learn about Islam and eat Malaysian food at the Kedai Makan restaurant. Registration is required and donations will be accepted at the event to cover Shaiq’s travel expenses. The Indo Cafe event was also sponsored by Project Feast, a nonprofit run by Veena Presad, who helps refugees and immigrants succeed in the food industry by bringing new people to their tables. The nonprofit holds monthly dinners in culturally diverse restaurants for people with adventurous minds and appetites. “We empower refugees to use food as a way to have intercultural exchanges,” Presad explained. And so people gathered around a table covered not with a tablecloth, but shiny green banana leaves and plates of Indonesian specialties and only serving utensils. After ceremoniously removing the top of a crown of yellow rice called tumpeng, people dug in, eating with their hands. A beef dish called rendang sapi, soybean cakes called tempe mendoan, a salad made of collard greens, bean sprouts, green beans and cabbage. About 15 minutes in, Shaiq stood and told the group her story: Born in Pakistan, she came to the United states in 1978 to marry her husband, who had attended college here. They raised three children in Fremont, California, where Shaiq still lives. She told the story of the coffee shop, and how it has changed her life. She has spoken in churches, schools and private homes from California to Massachusetts, explaining the differences between Sunnis and Shias (the two main sects of Islam); the rights of women in Islam; the five pillars of Islam (faith, prayer, charity, fasting and a pilgrimage to Mecca). Yes, it is a patriarchal religion, she said, but as a Muslim woman, she is not required to work. If she does, she can keep her own money, she said. “Who would not like that?” Shaiq asked. One man raised his hand. And she spoke about what it’s like to be an American Muslim today, post-9/11 and postelection, when people feel more free to show themselves. I mentioned that my gym has a night for Muslim women, when they attend spinning classes wearing hijabs. How do they bear the heat? But is it rude, someone asked, to walk through a room where people are praying? Some Muslims pray five times a day. One daughter was once questioned by the FBI for four hours in an airport; another is moving to the Philippines “because she’s sick and tired of everything.” And after Trump’s Muslim ban, Shaiq canceled a trip out of the country. She said she doesn’t understand how it seems radical groups are allowed to represent the whole of Islam. “It’s like the gang mentality,” she said. Someone asked if Shaiq thought an American president could lead a peace process. Are there progressives in the Muslim world? “My hope is that you are all ambassadors, now,” Shaiq told the group. “I can only go so far. “So make the effort,” she said. “Smile at people. A smile in itself breaks so many barriers. Make something for your neighbor. Go knock on their door and own it. I bet they won’t slam the door in your face.